ABS is the second most popular 3d printing material, beaten only by PLA. It’s widely available and cheap to buy. With ABS you can create parts that are impact resistant, durable, and resistant to weather and heat. ABS parts are also easy to post-process, with sanding, painting, and vapor bathing all easy options you can use to get you the finish you want. Outside of 3d printing, ABS is commonly used because of how useful its properties are. In fact, an array of consumer products are made of ABS, from Legos to keycaps. ABS plastic was one of the first materials to be 3d printed, and it is still a staple in industrial 3d printing. ABS stands for Acrylonitrile Butadiene Styrene, and these are the three components that make it up. Each of these components brings different characteristics to ABS, and their ratios can be adjusted by the manufacturer to give different properties. ABS is easy to clean up and apply finishes to after 3d printing. It can be machined, polished, sanded, filed, painted with ease. On the downside, ABS is a little more tricky to print with compared to PLA because it is more sensitive to changes in temperature. Useful for printing parts which undergo a lot of wear and tear. Prints made with ABS can be easily cut with a sharp knife or a cutting tool without splintering or breaking. Heated Bed: If you don’t have a heated bed then ABS is not for you. ABS is very prone to warping, and if the bed is not near 110℃, your prints will likely fail. Bed adhesion: You must use build plate adhesion to hold your prints down. You can use glue or hairspray on a glass or metal bed, or apply a grip surface such as BuildTak. ABS Print Temperature: A general guideline is to have your hotend temperature at 235℃. 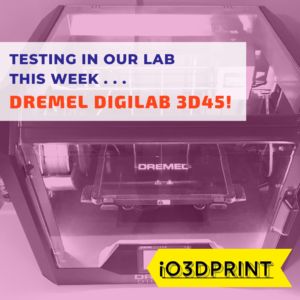 However, depending on the brand and color of the filament, you may need to calibrate to determine the right temperature. It can vary between 220C to 250C. This can be done by printing small test prints. Turn off the fans: ABS needs warmth, and it needs to cool gradually. Turn off your fans and let it cool naturally. Large Prints and Thin-walled Prints are Harder: Due to irregular cooling, larger and thin-walled prints can be harder to print in ABS. 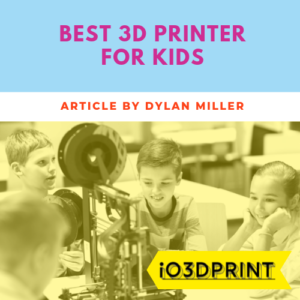 This is because it’s difficult to maintain an even temperature over a larger area, so parts of your print cool quicker than others and delamination of layers or warping could occur. For example, it’s common for heated beds to be warmer near the center and cooler at the edges. If your print covers your bed, the extremities may cool and warp as the extruder is trying to lay more plastic on top. Enclosure: You will see a tremendous reduction in failure rate if you print in an enclosed printer. If your printer is not enclosed, you can build a simple and cheap enclosure to contain the heat. One of my favorite DIY enclosures is using an IKEA Lack table and polycarbonate side panels. Clean the Extruder: If you’re printing ABS for the first time make sure to clean the extruder out to ensure no contamination of other materials. In most cases just extruding a reasonable length of new filament should be enough. Bed Levelling: Make sure your first layer is right by leveling the bed. It is a simple process, and you only need to do it once every few months. Vapor smoothing or polishing is a simple process you can do to smooth out the surface of your ABS prints. It removes all the layer lines that are an unavoidable fact of 3d printing. This gives your prints a super smooth finish as if they were molded. To vapor smooth your prints you dip into them into a tank containing the vaporizing liquid at the bottom. The liquid doesn’t touch the print. Instead the vapor rises and surrounds the print, gradually melting the surface. The longer you leave your print in the vapor bath, the smoother it will get. However, you will also begin to lose fine details, so you need to experiment a bit to see how long you need, or at least just remove your print from the vapor bath once you’re happy with the level of smoothing. Acetone is commonly used for vapor smoothing. However, you should be careful as Acetone is highly flammable as both a liquid and a vapor. It also has an unpleasant smell. For safety, it’s best to do vapor smoothing outside on a metal or concrete surface. Diameter – You need to look for a filament that has a consistent diameter along its length. Filament manufacturers usually quote a tolerance for the thickness, for example, +/- 0.05mm but they don’t always live up to this. If the diameter varies too much as you print, you will be effectively feeding your printer too much or too little material, this means under or over-extrusion. Moisture – Good filament will be packaged in a completely air-tight sealed bag to prevent any ingress of moisture or damp air. Inside the sealed bag there should be a desiccant like silica gel, which absorbs any moisture that was present in the bag or filament when it was first sealed. 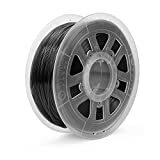 The longer filament is stored, the more likely it is to absorb moisture, so it’s good to buy filament from a store that has a high turnover of stock rather than something that might have been in a warehouse for years. If you buy a filament which has absorbed moisture you will notice spitting sounds in the hotend as the pockets of moisture get heated and turn to steam. This causes poor print quality and poor bed adhesion. Impurities – High-quality filament will contain 100% ABS and color ingredients and nothing else. 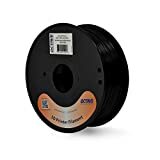 Poor quality filament may contain unknown impurities due to poor quality controls or deliberately added ‘fillers’ that bulk out the filament and reduce the cost of the material for the manufacturer. impurities can have an adverse effect on your prints in many ways, from just reducing your print quality to excessively wearing your nozzle and extruder. 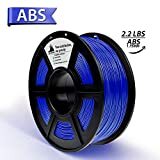 Next up, I’ve reviewed eleven of the best ABS filaments to help you decide which one to pick for your 3d printing projects. 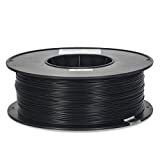 AmazonBasics brand is well known for giving us some high-quality products at reasonable prices, and their ABS 3D Printer Filament is no exception. 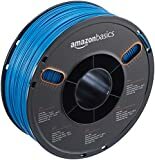 Not only is it a solid product, but Amazon has also gone the extra mile including some extras, like a resealable bag and a filament usage gauge. 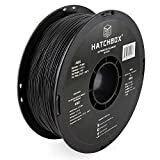 HATCHBOX is highly regarded for their reasonably priced PLA filament and their ABS filament is equally as good. 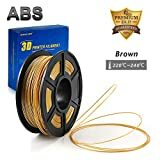 In fact, it’s one of the most popular and highly rated ABS filaments available. It gives a particularly glossy finish. 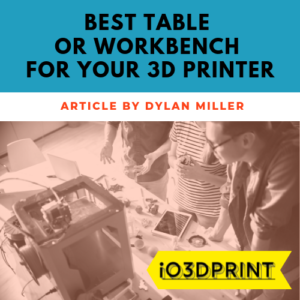 It tends to print at a higher temperature than most ABS and has a tough finish as a result. 3D Hero ABS 3D Printer Filament gets some great ratings by owners. It’s available in a transparent version for a unique finish. 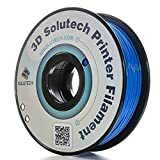 3D Solutech has become one of the go-to budget filaments. Because of its low price, it’s often the filament people choose to have their first try at printing ABS. 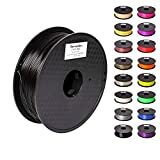 3D Solutech has one of the best ranges of colors for ABS filaments, so if you want something unique, they are a good choice. Some users find that different colors print better at different temperatures, so it’s a good idea to do some test prints each time you swap colors. IC3D are based in Ohio, USA, and they test all of their materials in their in-house lab. This ensures their materials, including ABS, are ahead of the competition and meeting a high spec. The IC3D Black 3D Printer Filament has been tested by many consumers on projects with some good results. It attracts good ratings and positive feedback from most people who give it a go. You can buy IC3D in a range of spool sizes which can make it an economical choice for big projects. Available Sizes:2 lb, 5 lb, 20 lb. Good adhesion on heated glass beds using only a glue stick. Inland is an experienced 3D printer filament maker. They specialize in manufacturing various filament materials for 3D printing. The Octave company is known for manufacturing ABS filaments. This filament has been tested on a variety of 3D printers. Compared to PLA, ABS has plenty of benefits to offer you. If you’re after making more robust parts that can withstand a drop, or getting weather-beaten, or you want a super smooth glossy finish, then ABS is your answer. The price of ABS is that it’s not as easy to print as PLA. You will need an enclosed printer (DIY is fine) and a good heated bed. The ABS filaments can certainly produce quality prints providing you get your printer settings right and most importantly the temperature. The ABS can produce pieces which are impact resistant and durable. ABS is flexible as compared to PLA, and this means that the objects made with ABS will bend easily and not break. So it’s an excellent choice to make all types of mechanical parts which will be durable. You can finish the piece in any way you like since you can cut, paint, sand, and bond. The acetone vapor smoothing process works very well on ABS which can give you smooth and shiny objects. 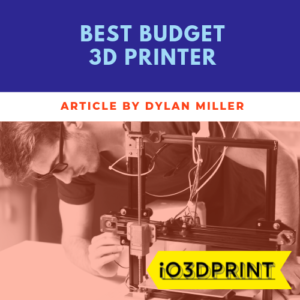 ABS is probably not the best material if you are new to 3D printing, but you can really benefit from it if you get your printer configuration right. It allows you to print complicated 3D objects with ease which will withstand many kinds of stress and rough treatment.